Discussion in 'Weapons, Technology & Equipment' started by von Poop, Jun 3, 2008. I pottered onto it while looking for web-based stuff on the Cromwell, there really doesn't seem to be much out there. Can anyone recommend any good Cromwell pages? I've got the Osprey, and Fletcher's HMSO book, but like many of the main British vehicles nothing really in depth. Cromwell, Matilda, Crusader, etc., they're all crying out for treatments beyond Bryan Perret's. Not sure David Fletcher could quite extract as substantial a story as 'Mr Churchill's Tank' - that being something of a special case - but surely there's scope for something more solid. This scarcity of major books on British types must be why so little is on the web, the world and his wife can show you chapter and verse on Tiger, Mark IV, or StuG, but Cromwell stuff seems scattered about in dribs and drabs. This scarcity of good books on British types must be why so little is on the web, the world and his wife can show you chapter and verse on Tiger, Mark IV, or StuG, but Cromwell stuff seems scattered about in dribs and drabs. It is somewhat frustrating and it comes to light especially when looking for source material when you are modelling Allied Vehicles. There seems to be no shortage of photos of German Vehicles even in color but Allied Vehicles seem to attract less attention. As you both say, there is infuriatingly little information to be gleaned on British subjects in general. Both organisationally or to do with equipment and vehicles. Maybe that will change, certainly the 1/35th scale modelling community has had a lot of new British releases to celebrate recently. Who knows maybe the message is finally getting through. Something's definitely shifting, seems to be many sharing the same perception of neglect of Allied gear. Modelling does kind of underline things though, for most German vehicles I can check details with a single Spielberger or Jentz book, however the last Cromwell/Centaur I did was accompanied by a mound of books, each with a paragraph or picture of relevance but no cohesive collection. If I need solid one-volume stuff on Yank stuff I can always buy more from Hunnicutt (Ha! When I can afford 'em), it really does seem that of the Major combatants the British tanks are neglected. Then again I'm still looking for decent encyclopedias of French & Italian types, though their marginalisation is perhaps more understandable. Type 'Cromwell Tank' into Amazon (and even most specialist sellers), and the results are frankly pathetic. Don't suppose anyone (Bod?) knows if the excellent Concord series has a specifically cromwell book? That'd at least be a fine concentration of pictures, but it's really always the development history that interests me. The more I think about this the more I understand the high (mad) prices Fletcher's 'The Great Tank Scandal' & 'Universal tank' command. They're just about it as regards British armour development. Well overdue for a single volume reprint those two. Current state of play on Cromwellism? I suppose a book could include the Cavalier and Centaur as well as the Cromwell and probably have enough to talk about. I would not recommend Osprey's "Cromwell vs Jagdpanzer IV" as a Cromwell source, too much errorrs, its JgPz IV part is ok.
Seroster and von Poop like this. Have you seen the book from the Rolls-Royce Heritage Trust, VP? Best form is probably to buy it from the RRHT themselves here. The big problem with writing a book about the Cromwell from my point of view (*cough*), is that it would be such a huge project, because the surviving archival records are so copious. It's a strange paradox that the Cromwell is so meticulously well documented that it would be a huge struggle to adequately condense it all. This is why so many authors shy away from it, I think. That is a factor I had not considered! my favourite cromwell book is the rolls heritage trust series no. 35. we owe W.A Robotham a debt of gratitude for his endeavours. my favourite cromwell book is the rolls heritage trust series no. 35. Good enough for me, chaps. And I've a feeling Bod or someone has suggested it before. I'm waiting for a bit, though. Things getting silly this month re books. Probably... It does look rather good. Oh, they have an ebay page. Free postage, Paypal and decent prices on new books (some of which the book-fairies are busily inflating elsewhere for tatty copies). Well, VP, if you have bought it, perhaps you could read it and do a review for the forum? I'd appreciate it! AFV of the World, Vol 3, British and Commonwealth AFVs 1940-46 published by Profile Publications in 1971 and edited by Duncan Crow has a chapter on Cromwell written by a Major James Bingham RTR. I'm far from an expert on Cromwell but it seems to give a fair overview. 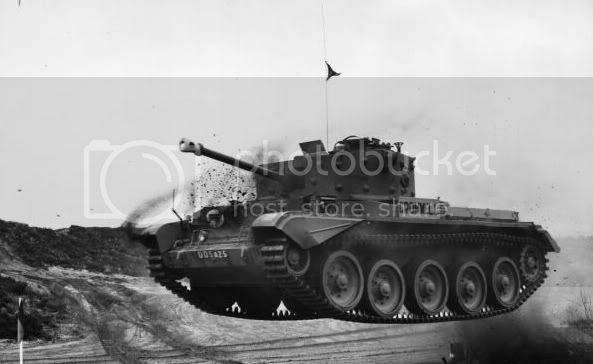 ....and with this version of what I assume is the same text and photos for Cromwell, you get the best of both Worlds - Cromwell and Comet together. Phew, thank goodness I didn't big up that reference!